Inspired by mushrooms, yes mushrooms… The subtle earthy flavor of cremini mushrooms go well with the sweetness of sun-dried tomatoes. This recipe works exceptionally well with Mushroom Ravioli or pasta like linguine. 1. Sauté diced garlic and the optional Peperoncino Fiocchi (hot pepper flakes) in 2-3 tablespoons of olive oil. 3. Once the buyer melts Add the 1/2 cup of chicken stock and let come to a boil. 4. After simmering for 5-10 minutes or so, add the sliced mushrooms. 5. 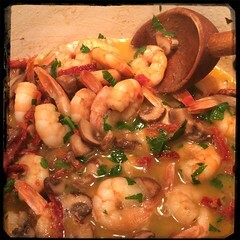 Once the mushrooms have softened, add the shrimp and a tbsp of butter. Let simmer for 5 minutes (not too long, as you do not want to over cook the shrimp). 6. Add the sun-dried tomatoes and chopped flat-leaf parsley and let simmer for 5 minutes or so. 7. Fold into the pasta and dress with fresh flat-leaf parsley.